No Childrens Festival or Kids Event is complete without the fun and engaging entertainment provided by bounce inflatable rentals. If you are on a festival board or event planning commission, make sure to book inflatable rentals early - up to a year in advance or more is not unheard of. 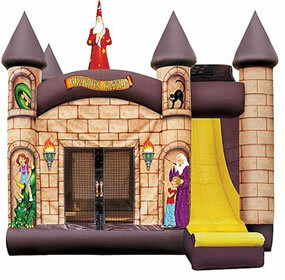 Inquire your inflatable rental provider and ask about a "pay per play" contractual agreement. This type of event agreement is great for large events and festivals where a greater share of revenue might be generated by single play or event wristband purchases. Find a Bounce House to Rent for a Kids Event.